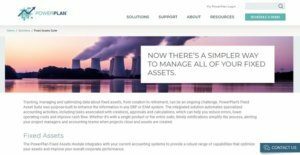 What is PowerPlan Fixed Asset Suite? PowerPlan Fixed Asset Suite is a management system for tracking and optimizing data related to created and retired fixed assets. The technology is designed to help improve the information in any enterprise resource planning (ERP) or enterprise asset management (EAM) system. The integrated platform of PowerPlan Fixed Asset Suite has solutions for automating specialized accounting activities. These include processes associated with creations, approvals and calculations that once rolled out can help users eliminate errors, reduce operating costs, and enhance cash flow. PowerPlan Fixed Asset Suite allows organizations of all sizes to oversee asset data more effectively. Timely notifications simplify the process, as it alerts project managers and accounting teams upon the finalization of a project and creation of assets. PowerPlan Fixed Assets Suite integrates seamlessly with users’ existing accounting systems to deliver comprehensive capabilities that streamline processes for month-end closing. Automated asset accounting reduces workflows and helps save on labor costs. Users can also avoid errors in key activities, including asset creation, depreciation analysis, calculation of interest and overhead, forecasting, retirement processes and others. Complete asset accounting documentation provides a reliable audit trail to support deductions, while a continuing property ledger (CPR) supports all types of location and property structures. With PowerPlan Fixed Assets Suite, users can save time as the system automatically calculates book depreciation via different methodologies. This is all while maintaining balances for GAAP, IFRS and regulatory jurisdictions. The PowerPlan Advanced Project Accounting module reduces reliance on manual procedure in order to cut down the time needed to execute action plans, but without compromising data accuracy. This helps produce better returns on projects of all types and sizes. Integration with acounts receivable streamlines the flow of data from assets to accounting, while bills are integrated from initial creation, monitoring, and resolution. Refundable contracts to a third party are facilitated effectively – from setup and calculation, monitoring, review, and reporting. Reimbursable processing includes setup, calculation, tracking, billing and reporting of reimbursable projects or work orders. Organizations can get more work done as PowerPlan Fixed Asset Suite accommodates all types of contracts and projects, with individual specifications for calculation, review, limits, frequency and deposits. Project managers are notified via alerts when projects close and assets are automatically generated. PowerPlan’s Depreciation Studies features deliver a wide array of industry standard statistical tools for forecasting asset service lives, salvage and removal costs. Users can calculate annual depreciation accrual rates and identify reserve adequacy. If you are interested in PowerPlan Fixed Asset Suite it may also be a good idea to investigate other subcategories of Best Fixed Asset Management Software collected in our database of SaaS software reviews. There are popular and widely used systems in each software category. But are they necessarily the best fit for your company’s special requirements? A trendy software solution may have thousands of customers, but does it offer what you require? For this reason, do not blindly shell out for popular systems. Read at least a few PowerPlan Fixed Asset Suite reviews and consider the aspects that you wish to have in the software such as the fees, main features, available integrations etc. Then, shortlist a few systems that fit your requirements. Try out the free trials of these products, read online opinions, get explanations from the vendor, and do your research meticulously. This exhaustive groundwork is sure to assist you find the most excellent software application for your organization’s special requirements. How Much Does PowerPlan Fixed Asset Suite Cost? Details on SMB and enterprise pricing for PowerPlan Fixed Asset Suite are not publicly available. Interested buyers may contact a sales representative to request for a customized quotation. We realize that when you make a decision to buy Fixed Asset Management Software it’s important not only to see how experts evaluate it in their reviews, but also to find out if the real people and companies that buy it are actually satisfied with the product. That’s why we’ve created our behavior-based Customer Satisfaction Algorithm™ that gathers customer reviews, comments and PowerPlan Fixed Asset Suite reviews across a wide range of social media sites. The data is then presented in an easy to digest form showing how many people had positive and negative experience with PowerPlan Fixed Asset Suite. With that information at hand you should be equipped to make an informed buying decision that you won’t regret. What are PowerPlan Fixed Asset Suite pricing details? What integrations are available for PowerPlan Fixed Asset Suite? PowerPlan Fixed Asset Suite integrates with top ERP, EAM and other financial systems. However, details about the specific partner programs are not publicly available. If you need more information about PowerPlan Fixed Asset Suite or you simply have a question let us know what you need and we’ll forward your request directly to the vendor.